Knock on Your Car. You Might Save a Cat. It's fall! In much of Japan, the weather is getting chilly. And while we bundle up, cats want to stay warm, too. And sometimes, they crawl up next to car engines for warmth. Remember that before you start your car! 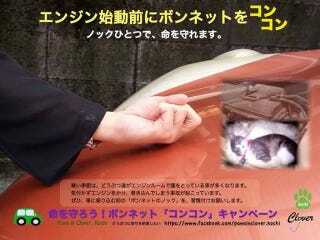 In Japan's Kochi Prefecture, a non-profit group launched a "knock knock" ("kon kon" or コンコン) campaign to remind people to knock on their car hoods to see if a stray feline has snuggled up underneath. Starting a car with a kitten on your engine is neither good for your car or the furry friend. The above image has been retweeted in Japan over sixteen thousand times. JAF, the Japan Automobile Federation, also tweeted out a reminder to knock on your hood late last month, and that tweet was retweeted over thirteen thousand times. So! Just take this as a friendly reminder. If you have a car, go ahead and give it a good neko (cat) knock before starting the engine.